The model is currently parameterized for German conditions using highly detailed farm planning data provided by KTBL in combination with farm structural statistics. 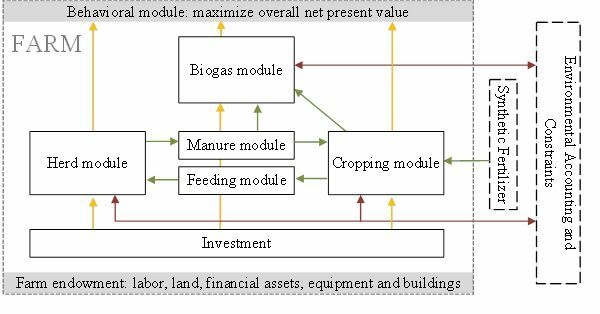 It offers a complementary approach to other farm scale models used in the institute such as the farm group models integrated in CAPRI or FADN based farm-scale progamming models which both are comparative-static, calibrated against observed farm programs with Positive Mathematical Programming while being far less detailed with regard to technology, and not comprising explicit investement decisions. The model is realized in GAMS, solved with the industry MIP solver CPLEX, linked to a Graphical User Interface realized in GGIG and hosted on a Software Versioning System. Design of experiments, building on R routines directly called from GAMS, can be used in combination with farm structural statistics to systematic sensitivity analysis by simulating different farm realizations (assets, farm branches) and boundary conditions such as input and output prices or emisisons ceilings using a computing server to solve several instances in parallel. That approach has e.g. been used to estimate a statistical meta model for Marginal Abatement Costs of Green House Gases from dairy farms. Code development and testing follows agreed upon guidelines. The application and extension of FARMDYN is part of several ongoing research activities at ILR, in cooperation with international and national partners. FARMDYN is used in the H2020 project LIFT (Low-Input Farming and Territories - Integrating knowledge for improving ecosystem-based farming, 2018-2022) by the team in Bonn and a team at INRA, Rennes, to compare different farming systems with regard to sustainability indicators. The FARMDYN team in Bonn and a group at INRA, Clermont-Ferrand merge their detailed farm scale models in the context of the project SustainBeef (Co-definition and evaluation of SUSTAINable BEEF farming systems based on resources non edible by humans, 2017-2020). 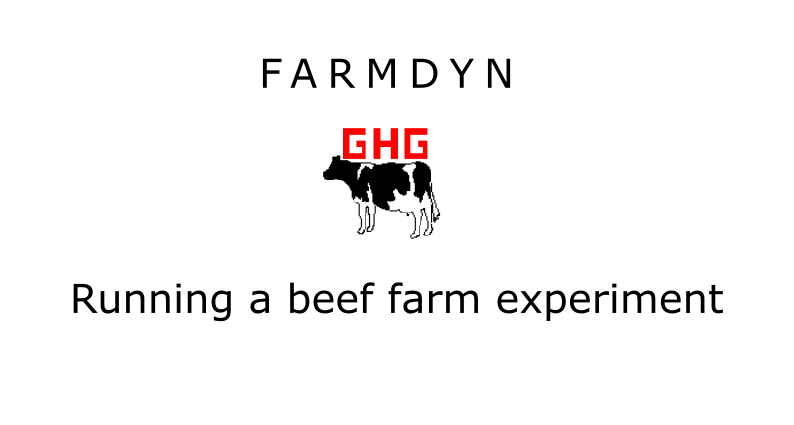 For FARMDYN, that will mean more detail for grass management and a better representation of beef cattle systems, as well as a parameterization for several case studies in Germany, France, Italy and Ireland. The project "Modeling structural change and agricultural nutrient flows across scales in regions of North Rhine-Westphalia", 2016-2019, financed by MKULNV (Ministry for environment and agriculture, state of North Rhine-Westphalia) aims at the analysis of nutrient exchanges between farms in regions of North Rhine-Westphalia based on the combination of FARMDYN with bio-physical and agent based modeling. The project is carried out by the chair of Production Economics and Resource and Environmental Economics at ILR and the Institute of Crop Science and Resource Conservation (2016-2018). In the project Understanding spatial interactions and structural change in the dairy production chain with a dynamic regional Agent Based Model covering dairy farms and dairy processing, 2015-2018, financed by DFG, dual profit functions for different farming systems are estimated from FARMDYN simulations to source an Agent Based Model (2015-2018). The original model version was developed in the project "The relation between indicators for the crediting of emission rights and abatement costs - a systematic modeling approach for dairy farms", financed by the German Science Foundation and carried out by Karin Holm-Müller, Wolfgang Britz, Bernd Lengers and David Schäfer. In the context of the pdh-thesis of Johanna Budde, a first version of the pig module was developed (2012-2013). Britz W., Lengers, B,.Kuhn, T. and Schäfer, D. (2014): A highly detailed template model for dynamic optimization of farms - FARMDYN, University of Bonn, Institute for Food and Resource Economics, Version September 2016, 147 pages. FARMDYN contains several features that are currently developed (flagged in documentation as prototype) or not used anymore (flagged as deprecated). These features have not been subject to the intensive testing for the stable release. They are only visible in the developer mode of FARMDYN and listed here. Schäfer, D., Britz, W., Kuhn, T. (2017): Flexible Load of Existing Biogas Plants: A Viable Option to Reduce Environmental Externalities and to Provide Demand-driven Electricity?, German Journal of Agricultural Economics 66(2): 109-123, Link. Lengers, B., Britz, W., Holm-Müller, K. (2014): What drives marginal abatement costs of greenhouse gases on dairy farms? A meta-modeling approach , Journal of Agricultural Economics 65(3):579–599 , Link. Lengers, B. and Britz,W. (2012): The choice of emission indicators in environmental policy design: an analysis of GHG abatement in different dairy farms based on a bio-economic model approach. Review of Agricultural and Environmental Studies, 93(2), 117-144. Lengers, B., Britz, W. & K. Holm-Müller (2013): What drives marginal abatement costs of greenhouse gases on dairy farms -a meta-modeling approach. Paper presented at the 2012 AURÖ-Workshop, Frankfurt (Oder), Germany, February 18-19. A short example of running a beef farm experiment and comparing results.